Arnold Böcklin (1827–1901), The Plague (1898), tempera on fir, 149.5 x 104.5 cm, Kunstmuseum Basel, Basel, Switzerland. Wikimedia Commons. In the first of these two articles, I looked at the spread of the Black Death across Europe around 1348-50, and some early apocalyptic paintings of its effects. After a century during which many European cities had continued to suffer outbreaks of the plague on a smaller scale than in the Black Death, it came to feature more in saintly narratives. Jacopo Tintoretto (c 1518-1594), Saint Roch Cures the Plague Victims (1549) (E&I 50), oil on canvas, 307 x 673 cm, Chiesa di San Rocco, Venice, Italy. Image by Didier Descouens, via Wikimedia Commons. 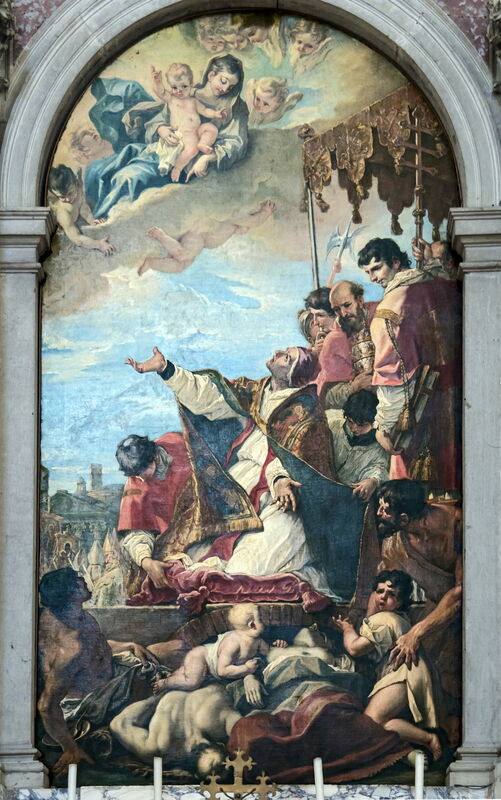 Tintoretto’s Saint Roch Heals Plague Victims from 1549 shows those suffering from plague brought to a small chapel, where this Venetian saint is healing them. The dark room is already collecting a disarray of bodies, some seemingly close to death. Without the miraculous work of the saint, this would quickly have become the waiting room for hell. This was painted for Saint Roch’s church, the Chiesa di San Rocco, in Venice. Jacob van Oost the Younger (1637–1713), Saint Macarius of Ghent Giving Aid to the Plague Victims (1673), oil on canvas, 350 x 257 cm, Musée du Louvre, Paris. Wikimedia Commons. 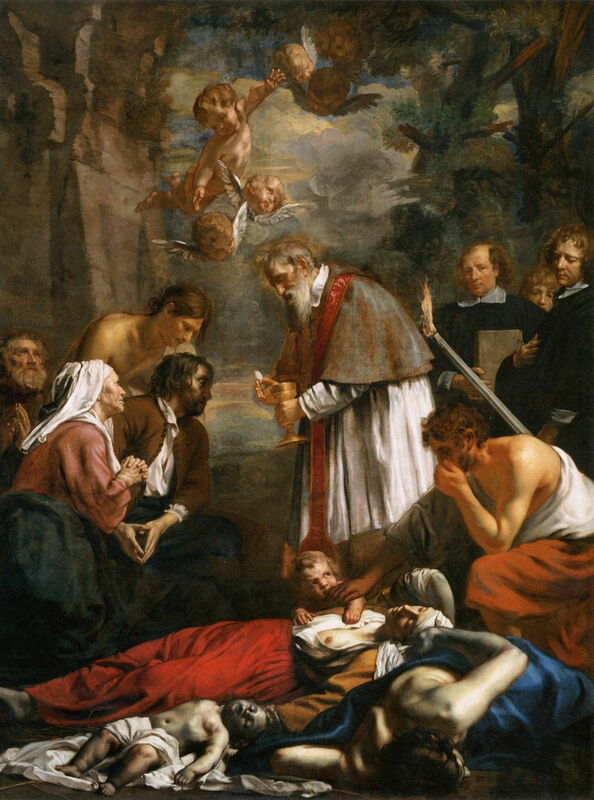 Jacob van Oost the Younger’s Saint Macarius of Ghent Giving Aid to the Plague Victims from 1673 shows a saint who is supposed to have been the Bishop of Antioch, and was captured by the ‘Saracens’ before escaping to Europe, where he joined the monks of Saint Bavo’s monastery in Belgium. He is thought to have died of the plague there. He is shown giving communion to those still alive, with the dead bodies of a family in the foreground. Sebastiano Ricci (1659–1734), Pope Gregory I Invoking the Virgin to End the Plague in Rome (1700), oil on canvas, 358 × 188 cm, Basilica di Santa Giustina, Padua, Italy. Image by Didier Descouens, via Wikimedia Commons. Sebastiano Ricci casts one of the greatest Popes in the role of intercessor, in his Pope Gregory I Invoking the Virgin to End the Plague in Rome from 1700. This may refer to an apocryphal story about this Pope, who was born just before the Plague of Justinian in around 542 CE. He is shown here pleading with the Virgin Mary in heaven to end an outbreak of plague. Giuseppe Crespi (1665–1747), Blessed Bernard Tolomei Interceding for the Cessation of the Plague in Siena (c 1735), oil on copper, 42.7 x 66.7 cm, J. Paul Getty Museum, Los Angeles, CA. Wikimedia Commons. 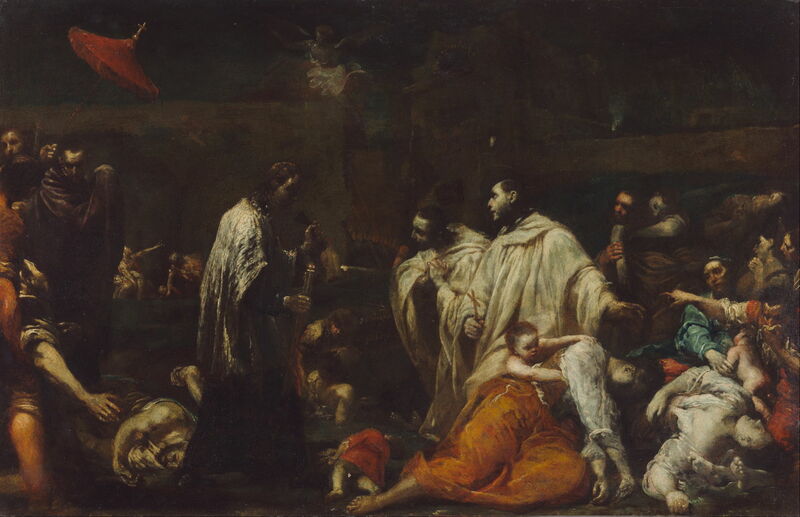 Giuseppe Crespi’s Blessed Bernard Tolomei Interceding for the Cessation of the Plague in Siena from 1735 shows a better-attributed episode which occurred during the Black Death in Siena, Italy, in 1348. Tolomei had founded the Olivetans, of the Blessed Virgin of Monte Oliveto, who wore white habits. When the Black Death reached Siena in 1348, he left that institution to care for the sick in the monastery of San Benedetto in Siena, where he died of plague on 20 August 1348. He was finally canonised in 2009. Giovanni Battista Tiepolo (1696–1770), Saint Thecla Praying for the Plague-Stricken (1758-59), media not known, 80 x 45 cm, Metropolitan Museum of Art, New York, NY. Wikimedia Commons. 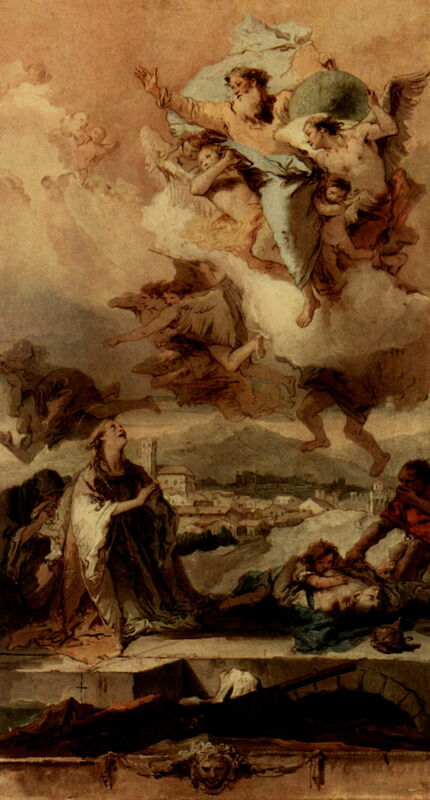 Tiepolo invokes another lesser-known saint in his Saint Thecla Praying for the Plague-Stricken from 1758-59. Thecla was born in about 30 CE, and travelled with Saint Paul. She is claimed to have practised as a physician, but doesn’t appear to have had any specific involvement with outbreaks of the plague. Here she is shown praying to God to bring an outbreak to an end, with a small Italian town in the background. Jules-Élie Delaunay (1828-1891), The Plague of Rome (1869), oil on canvas, 131 x 176.5 cm, Musée d’Orsay, Paris. The Athenaeum. 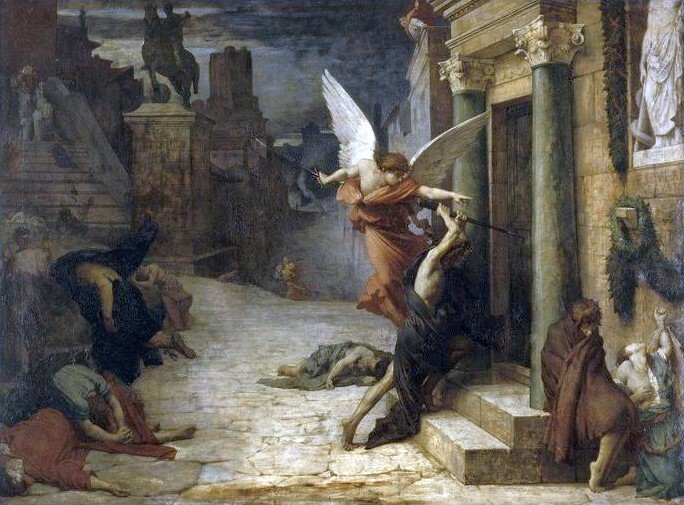 Jules-Élie Delaunay’s painting of The Plague of Rome (1869) is based on an episode reported in The Golden Legend, a mediaeval compilation by Jacques de Voragine, in which plague was raging in Rome. A pair of angels were claimed to have appeared, one good, the other bad. The good angel then gave the commands for people to die of the plague, and the bad angel carried the commands out. At the right edge of the canvas, the white statue appropriately shows Aesculapius or Asclepius, the god of medicine. It is thought that Delaunay based this painting on a fresco in the basilica of San Pietro in Vincoli, which shows an outbreak of plague in Rome in 1476. It was quickly popularised following exhibition of the painting in the Salon du Palais de l’Industrie in Paris, in the print below, and Delaunay’s painting was bought by Napoleon III for the public collection. 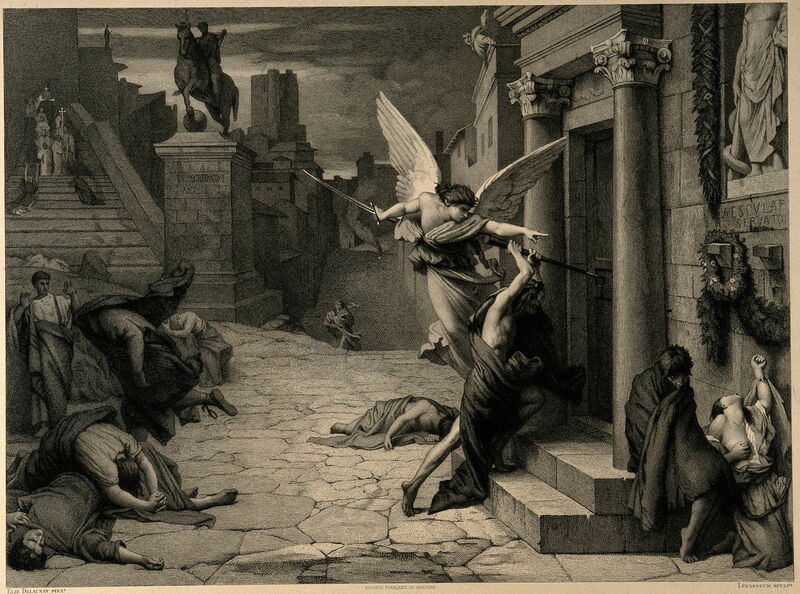 Levasseur after Jules-Élie Delaunay (1828-1891), The Angel of Death Striking a Door During the Plague of Rome (after 1869), engraving, 33.2 x 44.9 cm, The Wellcome Library, London. Courtesy of and © Wellcome Images, The Wellcome Trust. Theodor Kittelsen (1857-1914), The Plague on the Stair (1896), wash, pen, graphite and black crayon on paper, 27.3 x 22.8 cm, The National Museum of Art, Architecture and Design, Oslo, Norway. Wikimedia Commons. In the late nineteenth century, plague was an uncommon disease in Europe, although it still ravaged populations elsewhere, occurring as recently as the early twentieth century among mainly migrant populations in America and Australia. 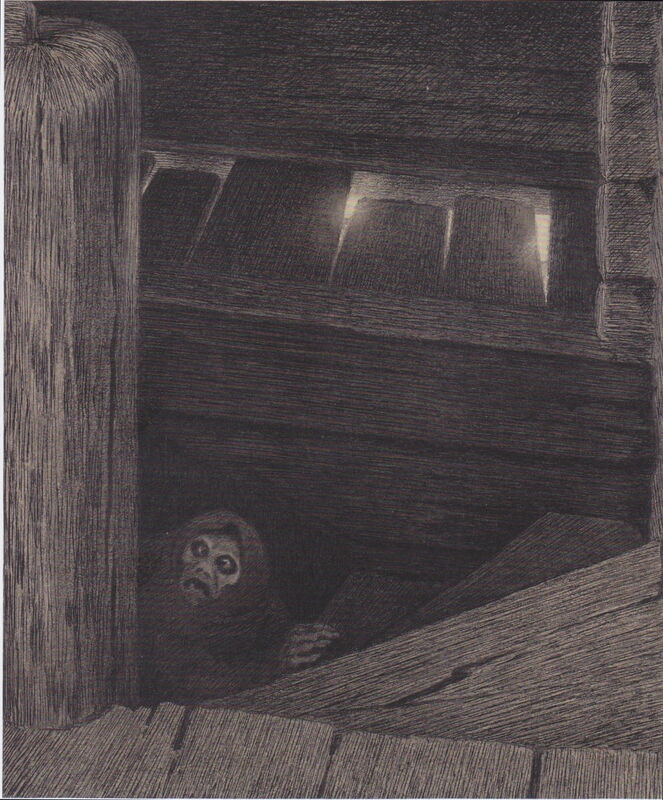 Theodor Kittelsen painted this nightmare vision of The Plague on the Stair in 1896 for engraving to illustrate a book on the plague. 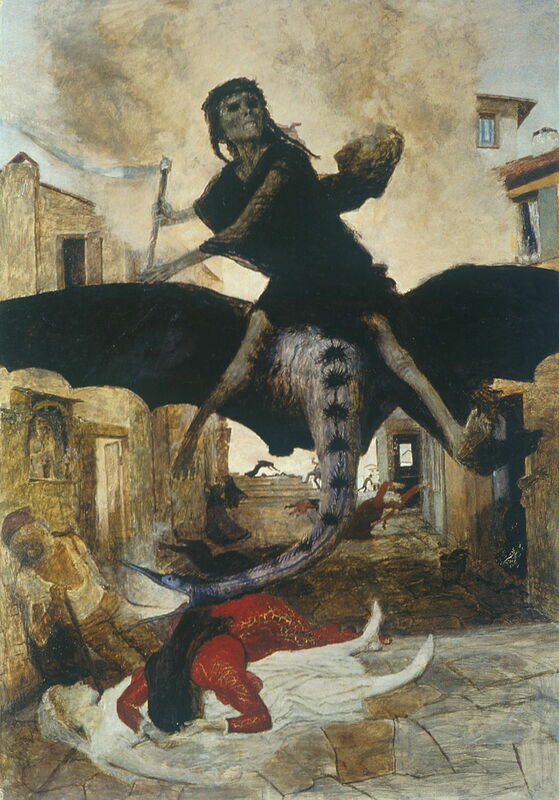 Arnold Böcklin reminds us that the spectre of death is never far away in The Plague, which he painted in 1898. Although the chances of this happening again should be remote, there are now ‘new’ infectious diseases such as Ebola which would prove even more deadly. Boccaccio’s account in the Decameron could then prove an understatement. Posted in General, Life, Painting and tagged Böcklin, Crespi, Delaunay, Kittelsen, Levasseur, painting, renaissance, Ricci, Tiepolo, Tintoretto, van Oost. Bookmark the permalink.